R1: Ch51. Sc in 2nd ch from hook. * Ch4, turn. Sc in sc. (Ch1, turn. Sc in sc) 3 times. Rep from * 5 times. Ch4, turn. Sc in sc. Ch1, turn. Sc in sc. Ch50. R2: Reattach yarn with a sl st in 1st ch3 sp. Ch3. (Dc, ch2, 2dc) in same sp. (2dc, ch2, 2dc) in ea rem ch3 sp. Rs3-4: Ch1, turn. Sl st across to next ch2 sp. Ch3, dc in same sp. (2dc, ch2, 2dc) in next ch2 sp. 2dc in next ch2 sp. R5: Ch1, turn. Sl st across to next ch2 sp. Ch3, dc in same sp. (2dc, ch2, 2dc) in next ch2 sp. 2dc in next ch2 sp. R6: Ch1, turn. Sc in same st. (3dc, ch2, 3dc) in next ch2 sp. Sk next 3dc. Sc in last dc. 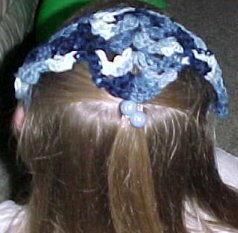 To reduce the risk of strangulation tie the kerchief behind the neck.